Strong gains quickly swept through cattle trade Monday morning with triple digit moves focusing on previous gains in cash cattle markets. Hog futures remain under light to moderate pressure as traders focus on new front month futures in the May and June contracts following April markets expiring. Lean hog futures remain under light to moderate pressure. Limited trade volume is seen through the entire hog market, as traders are trying to adjust to April contracts expiring with the new spot month futures holding a significant premium to where April trade left off. Cattle markets are holding triple digit gains at midday with buyers quickly returning to the market following the weekend break. Corn prices are lower in light trade. May corn futures are 3 cents lower. Stock markets are higher in light trade. The Dow Jones is 200 points higher while Nasdaq is up 34 points. 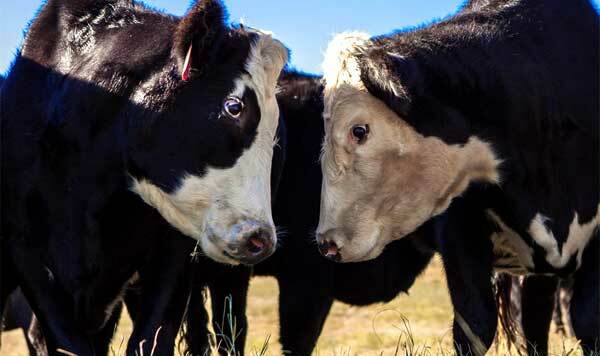 Nearby live cattle futures are holding gains near $2 per cwt with traders focusing on follow-through buyer interest quickly stepping into the complex. June futures are leading the market higher, but an aggressive $13 per cwt discount to the lightly traded April futures is limiting overall volume early in the week. The focus on potential follow through support in all areas of the market during the next couple of weeks could add even more momentum to the cattle complex. Cash cattle activity remains at a standstill Monday morning with show list distribution and inventory taking the main order of business. Even with the higher cash market prices last week, packers are expected to go into the week short bought due to the light trade volume developing during the end of the week. This may bring both sides back to the table earlier in the week than typical, but feeder lot managers are expected to remain chesty based on previous market moves and strong futures trade seen Monday. Boxed Beef cut-outs at midday are mixed, $0.64 higher (select) and down $0.47 per cwt (choice) with light movement of 57 total loads reported (31 loads of choice cuts, 11 loads of select cuts, no loads of trimmings, 15 loads of ground beef). Triple-digit gains have quickly developed through the entire cattle complex. This is allowing for increased overall buyer activity to move into the market with April futures holding a $1.40 per cwt rally as prices have moved above $140 per cwt during the morning session. Front month futures have not rallied more than $10 per cwt during the month of April as firm buyer activity continues to develop across the complex. Moderate pressure is seen through all nearby lean hog futures trade. April futures are now history, with most traders focusing on June contracts being the spot month contract despite May futures still remaining on the board. May contracts have such low open interest that traders continue to overlook this contract month due to the limited volume. June futures are trading above $77 per cwt even with a 37 cent per cwt loss during the morning. This is over a $20 premium on where April futures expired, leaving market fundamentals to try to catch up to the futures complex over the near future. Cash prices are lower on the National Direct morning cash hog report. The weighted average price is down 0.03 at $50.10 per cwt with the range from $44.00 to $50.15 on 3,233 head reported sold. Cash prices are lower on the Iowa/Minnesota Direct morning cash hog report. The weighted average price is down 3.41 at $48.11 per cwt with the range from $44.00 to $49.50 on 73 head reported sold. The National Pork Plant Report posted 192 loads selling with carcass values falling $0.89 per cwt. Lean hog index for 4/12 is at $53.23 up 0.26 with a projected two-day index of $53.53, up 0.30.